The letter, on behalf of 850 elected officials in New York State, comes days before the council decides whether to approve test drilling at two locations. New York's state lawmakers outlawed the process in December. 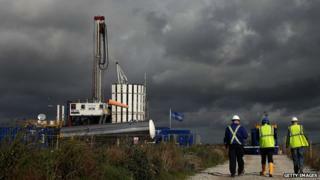 Cuadrilla, the energy firm behind the proposed drilling, said the US group had no knowledge of the case. In a statement, a spokesman for the energy firm said: "These officials from New York State have no knowledge of Cuadrilla's applications or of the regulatory controls in the UK and should not be interfering in the democratic process and decisions which will be made by the elected representatives of the people of Lancashire." The letter comes after Lancashire's senior planning officer on Monday recommended granting a licence for drilling at one of two sites. The county council begins four days of debate on Tuesday to discuss an application by Cuadrilla to extract shale gas at Little Plumpton and Roseacre Wood. Planning officers recommend approval for the application for test fracking at Little Plumpton but a refusal for Roseacre Wood. Elected Officials to Protect New York - made up of current and former politicians - has written to Lancashire's councillors asking them to note the findings of a two-year study by New York State Department of Public Health. Martha Robertson, Tompkins County Legislator, said: "After studying the public health impacts of fracking for years, New York State Health Commissioner Dr Zucker was clear that he would not let his family live in a community with fracking. "It is possible to stand up to this dirty and dangerous industry and ensure residents' safety." The letter rejected the fracking industry's case that it would bring jobs and prosperity. It added: "We urge you to treat these claims with deep scepticism. The experience in the US is that these claims are false and vastly overstated." New York bans fracking over "significant health risks"